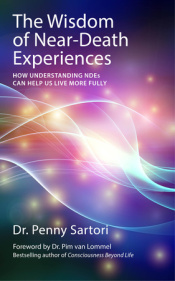 DR. PENNY SARTORI’S BOOK: The Wisdom of Near-Death Experiences CLICK HERE TO PURCHASE (paperback). BUY THE KINDLE VERSION: click here. Penny Sartori is a registered nurse who began researching Near Death Experiences (NDEs) in 1995 after one of her long-term intensive care patients begged her to let him die in peace. The event shook her deeply and eventually led her to enroll in a PhD program to research NDEs. The findings, along with the profound spiritual lessons that she has gleaned from her work, are published here. During her academic work, Sartori studied three samples of ICU patients during a five year period. The first consisted of 243 patients from the first year of data collection who survived their ICU experience. 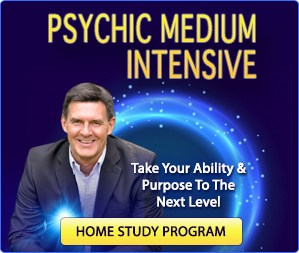 Of those, two experienced an NDE, and two an out-of-body experience (OBE). The second cohort consisted of survivors of cardiac arrest during the five year period. Of those, 39 patients (or 18%) experienced an NDE. The third cohort consisted of all the patients who experienced an NDE during the five year period. Their stories are captured in her new book. Dr Penny Sartori worked as a nurse in a British hospital for 21 years, 17 of those being in Intensive Care. She is highly experienced and skilled in her role as an intensive care staff nurse; and has conducted unique and extensive research into the near-death experiences (NDEs) of her patients. In 2005 she was awarded a PhD for her research into NDEs. Dr Sartori’s work has received worldwide attention and media coverage. She has spoken at many conferences both nationally and internationally and her work has received the attention of HRH Prince Charles. Thanks for another great interview, Bob. I was particularly struck by her statement that some NDE experiencers see people who are still alive. I wonder if this could be explained by something your previous guest said, ie. that we are multi-dimensional beings and therefore there is probably some aspect or dimension of a living person which is present, even though the alive person may not be aware of it. That was a interesting statement. You might be right. It’s certainly as good an explanation as any. That is exactly what I thought when she said that! I’m glad it gave you some comfort. And yet another awesome interview, Bob! Thanks! 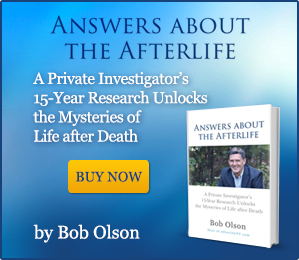 Great questions and btw, researching NDE’s for the past couple of years led me to your outstanding site. I was wondering about the same thing Judith was and thought that the multidimensional aspect coupled with the fact there isn’t any time (so why couldn’t you see someone there that is alive here) in the spirit realm could be the reasons. Guess we won’t know for sure ’till we get there. Anyway, fascinating as always! 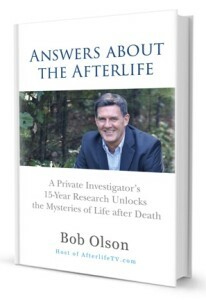 I have to say that with all the research and information out there, especially the years and years of study ad research undertaken by people such as Dr Sartori, how can anyone any longer say that there’s ‘no proof’ that there is an Afterlife? They just have to look! What an amazing woman and great interview! P.S I love the new promo for afterlifetv.com too. It’s brilliant! Winderful interview, Bob! ! Dr. Satori brings much gravitas to the subject and I will buy her book. Always enjoy your interviews! I read Dr. Sartori’s book and found it so interesting. I had experienced this type of thing when both my sister-in-law, and then years later, my grandmother passed. I felt jubilant and honored to be a part of it. I am one of those who can’t get enough of NDE stories. I feel that they bring such comfort and connection as well as being educational and awesome! I enjoyed watching my first interview, Just found this page by accident. Will be a frequent visitor! Have been fascinated with afterlife and death since I was very young!. Watched most of the film collection called”Faces of death” in my early adulthood. Have multiple books on NDE from some of the earlier pioneers on the subject. Glad I found you, Dr. Olsen.Will look for your books at the stores!! I’m glad you found Afterlife TV too. You won’t like find my book in stores. The best place to get it is Amazon: http://www.amazon.com/dp/0965601986/?tag=ofspiritcom07-20 My best wishes to you. I enjoyed your show with Dr. Penny Satori,and it brought me back to an experience I had when I was 19.I have to say the NDE I had didn’t show me relatives,or family members,but I did feel a love that was so strong and unbelievable .I did remember seeing my mother ,brother and myself when I was a very young child sitting on the beach enjoying a picnic lunch. I also had feelings of peace,happiness,protection. (I was drowning) and a feeling of dryness, and NO wetness. For lying on the ocean floor and seeing perfectly clear, my vision of the ocean floor that was so clean and bright.This was a very strange experience and I can still feel it and remember it just as clear as it was 41 yrs. ago. 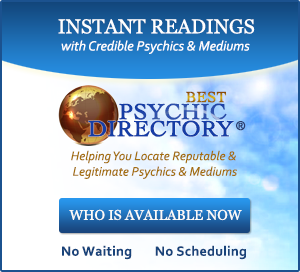 I have to ask you,I have had psychic experiences all my life and made a lot of accurate predictions,but what I want to do and it bothers me is,I would like to contact spirits and I can,but I have no control as to what comes up.I listened to plenty of programs that talk about chakra’s and to me that is a waste of time.There has to be a way to tune in and have the experience I’m searching for.If you have anything I can use to accomplish what I want to achieve I would appreciate it.Ohhhh,Keep up all your great work,I love your show and all your guest…. As you know, I just answered you on another video’s comment. But thanks too for sharing your cool experience. I flat lined in 2008 (pulmonary embolism) and did not have an NDE. Has anyone done any research on why some people do, but most do not? I think a comparison could prove to be interesting. A lot of people die temporarily for a few seconds or minutes and come back to life without having an NDE. It’s a bit like why some people get in bad car accidents and don’t get hurt and why some people don’t make it to the airport before the plane leaves. If it’s not an experience that you’re meant to have, then you don’t have it. I don’t think it’s really any great mystery other than that. As wonderful as these experiences sound, there is also a lot of difficulty that comes with the NDE too. Many people wish they didn’t come back. Others feel guilty that they did come back. Many find their family and friends don’t believe their NDE story. And many feel very alone with their experience because they don’t know if it was real or not, because (believe it or not) there are still a lot of people out there in the world who have never heard of near-death experience. So in these ways, those who don’t have one do not have to suffer through these consequences. That’s a wonderful gift to have that contact. Thanks for sharing. As a child I had an out of body experience but not an NDE. I was hit by a car at age 5 but no NDE. Later in life I have lost many people to death. All those who were close have come back to me at least once to let me know they loved me and were ok. I treasure these experiences. I had another out of body experience and met Jesus but he sent me back saying it was not my time. My husband passed 3 years ago. While in the hospital he visited the universe and told me it was beautiful. Thanks for sharing those stories with us. Very cool. Even though I began my search for ‘truth’ with NDE’s, I am ‘very’ concerned with the ‘cultural’ claims of Jesus, Mohammad, etc. etc. 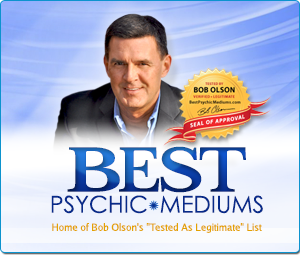 I at first accepted the possible excuse they didn’t realize these were ‘spirit guides’. However, the more I read the more I see people stating these ‘cultural beings’ said things ‘culturally’ in line with beliefs. My experiences indicate ‘spirits’ are not ‘liars or deceitful’ so I have to attribute these NDEs to drugs, etc. no matter how many ‘valid’ points. I agree that spirits are not liars in the way that you’ve described. I have witnessed spirits showing different sides of themselves for the benefit of a person getting a reading, however; but that’s a different situation. My father once came through to me on one side of a room and my wife on the other side of the room through two different mediums. To me my father came through regretful (of how he feels he let me down). To my wife, my father came through happy and grateful, saying she was like a daughter to him. So he wasn’t lying to either of us, but rather show different sides of himself in the spirit world. What I think the people you’re discussing are doing are seeing someone in spirit and “interpreting” that spirit as being the religious figure who they believe in. Later, when they describe what was said, they might blatantly alter what was said to align with their religious beliefs or they merely “interpret,” again, what was said to align with their beliefs (not quite the same as blatantly altering it). After all, spirit communication is typically telepathic, so this allows for more interpretation and alteration. Thank you for your view/answer —— you could be correct and it does help! That is why I like to talk/email to people making such claims when possible. 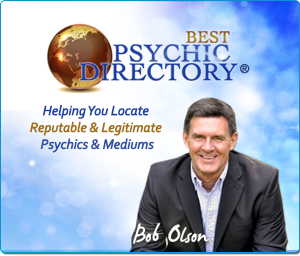 I recently met someone (not NDE) who made an amazing ‘spiritual belief’ claim based on a ‘spirit’ encounter, however, it was fairly easy to identify what the ‘true message’ was versus his interpretation assumption —– he did have to leap to get where he ended up. .
Well, Bob, you have done it yet again. I LOVE your interviews. I wonder how one who isn’t in the health field might find people to talk with about this kind of experience? It’s fascinating. Thank you again, Bob. Keep ’em coming!